Happy Friday! I hope that everyone had a fabulous Thanksgiving at that your bellies are FULL! I know mine is! 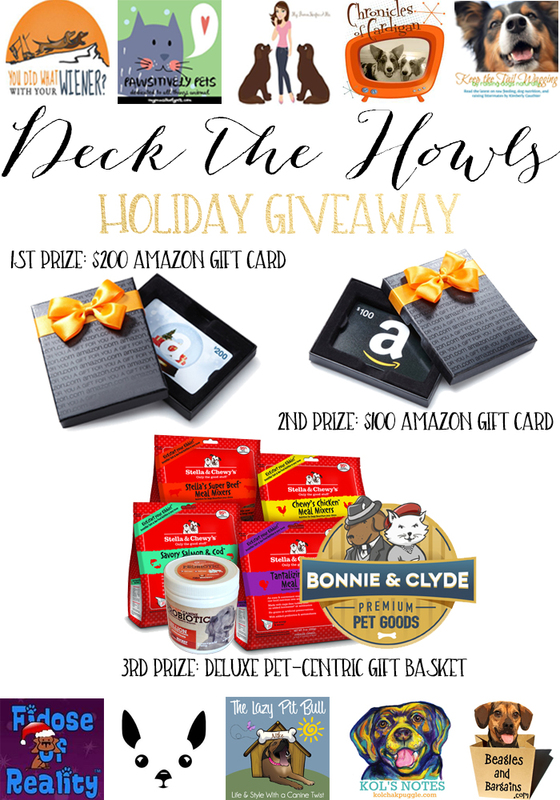 Today I’m so excited to be partnering with some of my absolute favorite pet bloggers to bring you this AMAZING giveaway just in time for the holiday season! Jessica at You Did What With Your Wiener? To enter the giveaway, simply follow the steps in the Rafflecopter widget below. There’s one mandatory entry and 3 bonus entries. HINT: To increase your odds of winning one of these awesome prizes, you’re going to want to visit each of the participating blogs listed above. You’ll be able to enter the giveaway on each of those blogs, and remember, the more you enter, the greater your chances of winning. Just be sure to get entered on each of the participating blogs by next Thursday night, December 3rd at 11:59pm EST. One “finalist” will be randomly selected from each of the 10 participating blogs. All of the finalists’ names will go into a drawing, and 3 winners will be randomly selected to receive the prizes listed above. The winners will be announced on The Lazy Pit Bull Facebook page next Friday, December 4th. Be sure you’re following Christina there so you don’t miss out! Good luck! Each participating blogger paid an entry fee which will be used to fund the gift card prizes. The items in the 3rd place prize package were donated by the participating brands. My favorite was the stuffing, my mother’s stuffing is the best – I look forward to eating it every year. The best thing is always the pie! What a great giveaway. The favorite thing I ate was a new pinterest broccoli and cauliflower veggie casserole. My favorite thing was the roasted turkey with gravy. I even gave some white meat turkey without the gravy to the dogs. They loved it too. The dogs also got some pumpkin on top of their food. Anything I don’t have to cook! I liked the apple pie. My favorite thing was the stuffing. My absolute favorite thing on Thanksgiving was my grandma’s famous noodles! My favorite Thanksgiving food was Hummingbird Cake. We haven’t had our Thanksgiving dinner yet (we’re having it on Saturday), but we had a pumpkin pie yesterday, and it was good! I am looking forward to the pizza on Saturday, though! We are very non-traditional. ? One question, though, I’m not on Facebook, will I still be able to participate? Thanks! Fab giveaway! I’ve never had any pumpkin pie before. My favorite food on Thanksgiving was the mashed potatoes and sausage gravy. I loved my hubby’s stuffing! Everything was good but I love my sweet potatoes. My dachshund loved the turkey. Sweet potato pie with marshmallows. My favorite was the turkey. Favorite food on Thanksgiving was definitely the turkey!!!! i love my sister’s loaded mashed potatoes! The favorite thing that I ate on Thanksgiving was the green bean casserole. I love green bean casserole. The best thing I ate on Thanksgiving was my mom’s chocolate bourbon pecan pie!!! Awesome giveaway!! Sweet potato fries were my favorite!! My favorite thing was the pumpkin pie I made! What a great contest, thanks! Let’s see if I had to pick a favorite thing I ate at Thanksgiving it would be my sister’s sweet potato pie – it’s actually the first time I’ve ever had sweet potato pie! All of it. Mamaw had 3 plates of everything so you know it had to be good. Mashed potatoes are always the best!! By far sweet potatoes are the best! Yummy! This year my favorite thing was my Mom’s stuffing and my Sister made some fantastic yams with a caramel marshmallow on top. My favorite food on Thanksgiving was the pecan pie my mother-in-law made, delicious! My favorite was the sweet potatoes with apples and pecans. Definitely, the pecan pie. It was delicious! my favorite thing i ate on thanksgiving was actually after thanksgiving…i love leftover sandwiches! deep fried turkey! and sweet potatoes! That’s a super hard one, but I have to go with gravy. My gravy this year was outstanding, not sure what I did differently, but it was SO good. My favorite is usually mashed potatoes, but this year it was broccoli casserole. YUM!!! Forgot to say this is an awesome giveaway. Thanks for the chance. The Turkey – it came out truly amazing this year! This year was real laid back. I cooked for only two. And then I watched football the rest of the day. Go Giants! My favorite food that I had for Thanksgiving this year was the stuffing and the green bean supreme casserole. Yum. Definitely my Dad’s homemade dressing! This super yummy rice my stepmom makes….i’ve tried making it and fail every time! Fruit salad, my Grandma’s recipe. She passed away when I was twelve and I’ve carried on the tradition. The sweet potatoes with little marshmallows on top was my favorite dish. Yum!